We love homegrown food, it’s no secret. Heck I think everyone should try to grow at least some of their food. Growing your own food is a great way to be more self-reliant. However many people think growing their own food may be to difficult a task. Maybe age and mobility is an issue, maybe outdoor space is an issue. However with some awesome advancements in Aquaponics you really can grow food no matter where you live. Aquaponics is the combination of aquaculture and hydroponics. Meaning raising fish combined with soilless growing. 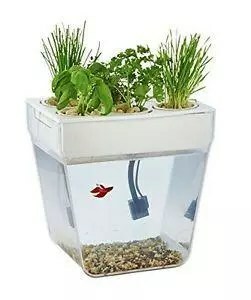 The fish fertilize the plants, the plants in-turn filter the water for the fish. There is much more science behind it than that, but that’s the just of it. Aquaponics is really a wonderful circular system, which needs much less water than traditional soil growing. When we first tried this method (mind you it was a bit of a learning curve). But we were surprised how fast our plants would grow. There are less to no weeds, watering it taken care of and pests are a minimal or nonexistent. We currently have a smallish set-up (one we plan to expand soon) in our DIY Greenhouse, the hubs also plans to automate this and add fancy controls that can help regulate and monitor our system (more on that in the future). 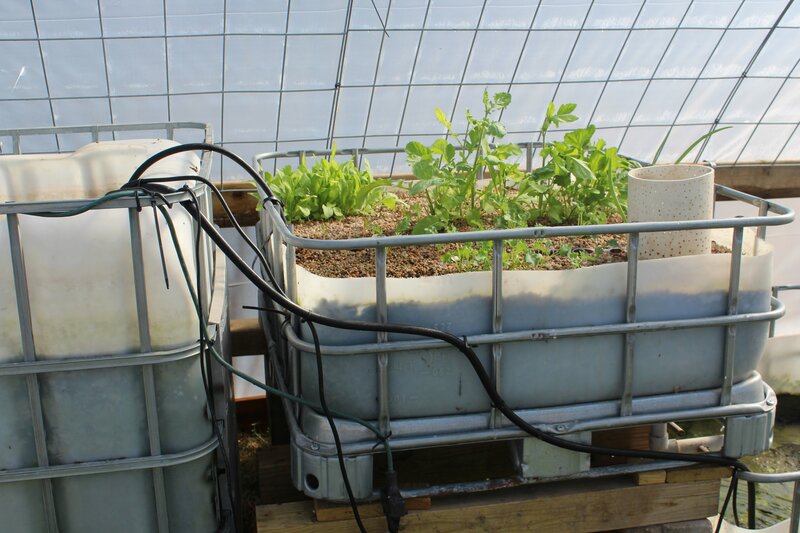 That is one cool part about aquaponics you can add on as you go. In this picture we are still getting stuff growing again after moving it all right before our greenhouse post a few months back , so you don’t see a ton growing. What we have is a large fish tank (on the left), a grow bed (in the center), and a sump tank (to the right). Now this is our set up but many set ups, don’t have a sump tank, just a grow bed and a fish tank. So maybe you are interested in trying to grow some of your own healthy veggies or greens but you are not sure where to start, or you would just like to start small. Perhaps you live in an apartment and do not have much space but would still like to grow some of your own food. 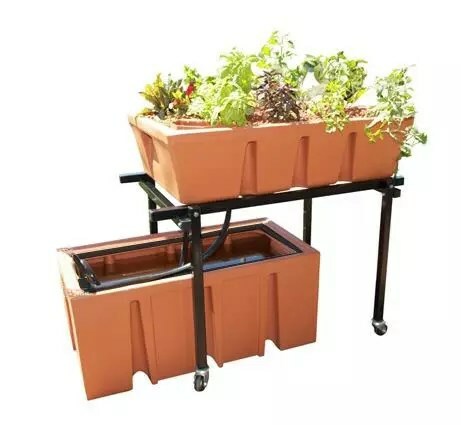 Here is a small system that is easy on the budget and small in space but would still be able to grow several herbs or something similar! This one was found on ebay. However there are many places to look for something similar, I have found some at Etsy, Amazon and Walmart. Still interested? Perhaps something that can grow a little more, maybe keep you in fresh salad and greens year round? That is totally a possibility. Greens are something I love to have fresh and on hand, and with Aquaponics you can no matter what time of the year it is. Here is a great one I found at Wal-Mart and still pretty easy on the budget. Space to add a grow light, and enough growing area to keep you in you most favorite greens or plants. One of my favorite things to do it re-grow green onions in Aquaponics, they will produce like crazy, you cut as you need and the regrow again! Perhaps you are like us and have a larger family and need something that can produce even more. There are systems set up for that too! Go Big or go home! This is actually where we plan to expand our current system to, 3 grow beds. 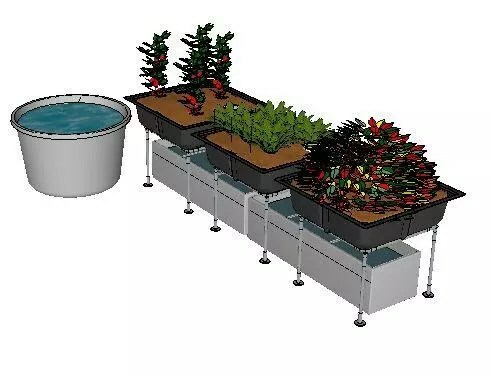 This a a modular system also found at The Aquaponics Source, you can get these in configurations from 2-8 grow beds. So maybe you have a greenhouse that your want to grow a lot of produce in a small area this would do it, guaranteed! So as you can see there are set ups for all budgets. So yes you really can grow your own food no matter where you live. 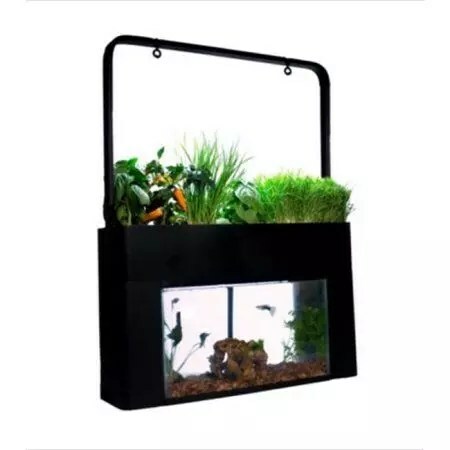 There are also amazing sites dedicated to DIY aquaponics like here or here, We have a DIY system and we have changed things over time, and as I mentioned earlier we plan to enlarge it as well.